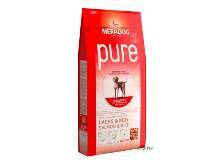 Mera Dog pure Salmon & Rice Dog Food is designed for adult dogs with unique nutritional demands, allergies, and/or intolerances. 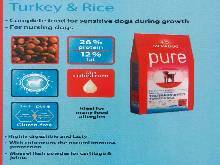 Food allergies and intolerances are becoming more common in dogs these days. Therefore, it is especially important to rely on harmless, high-grade ingredients. 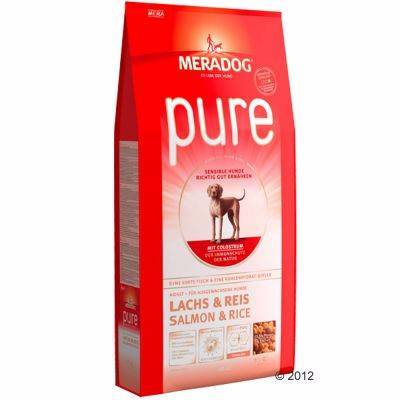 Mera Dog pure Salmon & Rice was designed with this concept in mind: with the concentration of salmon as the single source of animal protein and rice as the easiest to digest carbohyrdate source, this new product line is ideal for dealing with a variety of food allergies. 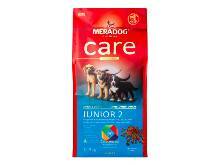 The Mera CareConcept in Mera Dog pure Dog Food is based on the latest nutritional research. 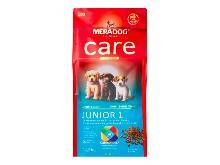 Due to the use of functional, natural ingredients, Mera Dog products are optimal for the following goals: Resistance and Cell Protection Vitamin E, Vitamin C, Beta-Carotin, Selenium: this special combination protects the body from harmful "free radicals." Beta-Glucane from high-grade Yeast: supports the Immune System. Fur and Skin Omega 3- and Omega 6 fatty acids, organically bound Zinc, Lecithin: important for healthy skin as well as for thick, beautiful fur. Digestion and Metabolism Soluble and Insoluble Fiber: natural digestion regulation. Inulin (not to be confused with Insulin) from the Chicory Plant: this natural, probiotic plant extract stabilizes the Gut Flora. Physique and Vitality Tailored Energy Content: for unhindered movement. The Single Protein Source, Salmon: distributes essential building blocks for muscles and joints.